When faced with limitless possibilities, will you find the one that defines you? At Saint Anselm College, you’ll be ready to do something big. Something unprecedented. Something that allows you to play to your strengths and find your passion. You’ll take a new look at the world and see how it could work better. When you’re faced with challenges, you’ll have the confidence and perspective to rise to every occasion. 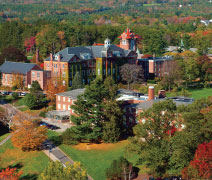 Saint Anselm is a Catholic, Benedictine liberal arts college in Manchester, New Hampshire. A strong foundation in the liberal arts and sciences will serve you well no matter what career you choose. In addition to a solid background in the academic disci-pline you choose, you will gain skills crucial to future success: the ability to think independently, approach challenges creatively, and commu-nicate effectively. Our professors are the heart and soul of the academic experience. They’re here because they love to teach. Saint Anselm classes are small and there are no teaching assistants—so your pro-fessors know who you are and what your goals are. They are ready to chal-lenge you, inspire you, and guide you. To compete for jobs in a tight econo-my, you need experiences beyond the classroom. At Saint Anselm, practical learning experiences are limitless. Completing an internship, serving on student government, collaborating on a professor’s research, and studying abroad are a few of the ways you can enrich your education and enhance your ability to succeed in graduate school and begin your career. Many of our incoming students al-ready have some volunteer experi-ence. At Saint Anselm College, their volunteer impulse can flourish. The Princeton Review and the Carnegie Foundation for the Advancement of Teaching both commended the College for its commitment to pro-viding service and service learning opportunities, from teaching English to new Americans to working with at-risk teens. Tomorrow’s leaders should have as much access as possible to today’s leaders. At Saint Anselm, every stu-dent can have that access, whether they major in Politics, Biology, or Nursing. 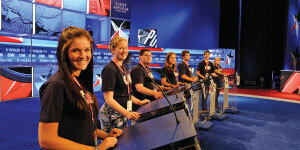 Because New Hampshire holds the nation’s first primary, the College is a must-stop on the cam-paign trail and often hosts nationally televised debates. It’s not unusual to meet political figures and world leaders right on campus. In fact, 10 presidents have visited Saint Anselm College in the past 50 years.